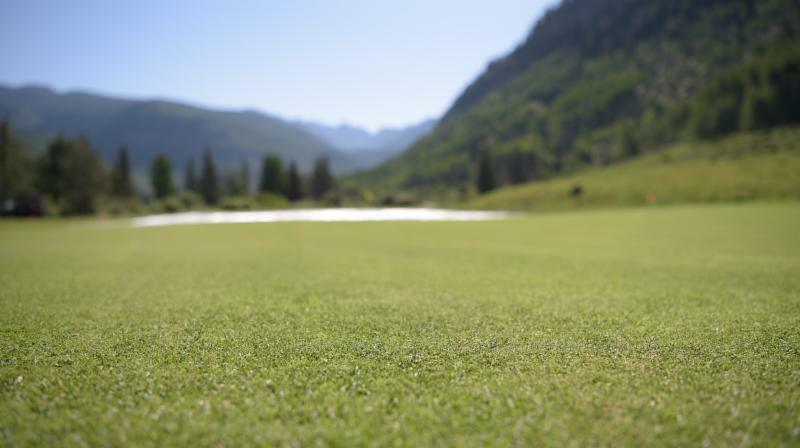 (Vail, Colo.) -- The Vail Golf Club is excited to announce that beginning Monday, July 2, the golf course will be fully open, with 18 holes of golf and all regulation greens in play. Due to the unusual weather and snowpack conditions over the winter, the golf course was delayed in opening some of the regulation greens, but thanks to the hard work and expertise of the Vail Golf Club course maintenance staff, all of the greens will open for play on Monday. Additionally, anyone who plays a round of golf between now and July 20 will receive a free beer or soft drink in the Grill on the Gore restaurant following their round. Season passes and punch cards are on sale, and are being offered at a 35% discount for passes and a 10% discount for punch cards. These can all be purchased online at www.vailrec.com/register. For more information on the Vail Golf Club and to book your next tee time, please visit www.vail.golf or give us a call at 970-479-2260. See you soon! The Gore Range Mountain view from the Grill on the Gore deck is second to none. 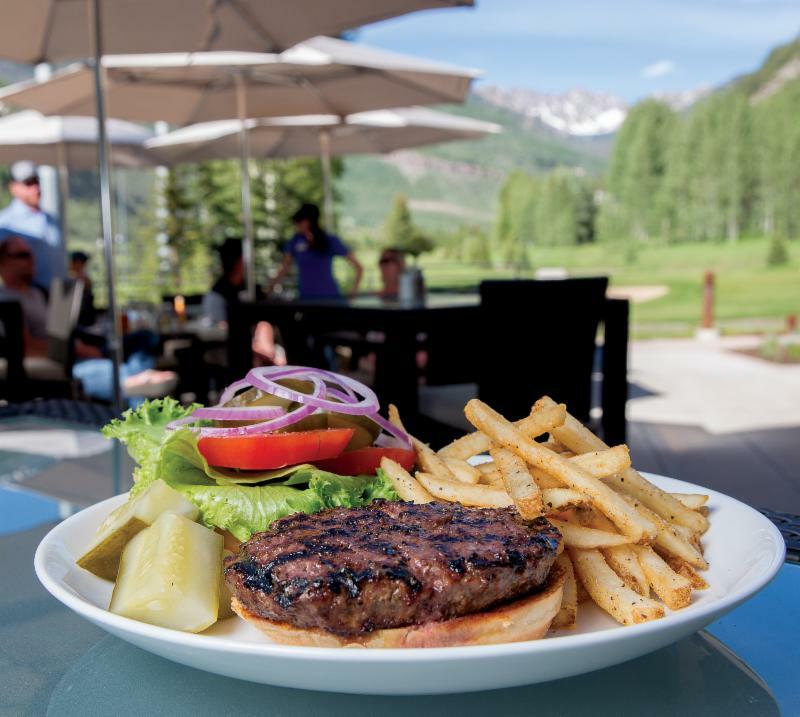 The Grill on the Gore restaurant, located inside of the Vail Golf & Nordic Clubhouse, is now open from 11 a.m. until 8 p.m. daily. Check out our signature lunch and ápres-golf dishes, featuring hand-crafted soups, salads and sandwiches made with Colorado-sourced ingredients. Specialty cocktails and a diverse craft beer selection are also available daily to enjoy after a round of golf or a hard day's work. Take in the best seat in the valley and see the spectacular alpenglow on the Gore Range. New this year, the Grill has added a custom smoker to the backyard, and smoked meats have been added to many of the dishes. The Vail Golf Club now features a chef's garden where many of the herbs and vegetables are being grown on-site. Take a look at the summer menu and come join us soon for lunch or dinner! This summer, the Vail Golf Club continues their lineup of popular programs for ladies, men, seniors and youth. Hone in your golf skills during the Sam Adams Swing Hour, or join in one of our summer leagues. Did you know the Vail Golf Club also offers junior lessons and youth camps? Check out the full schedule below, and click here for more details. August 6-9 | Monday-Thursday, 10 a.m. to 4 p.m.
Mark your calendars and get your teams signed up for this year's fifth annual Businesses, Bogeys & Bragging Rights charity golf tournament on Thursday, Sept. 6! The new theme this year is #1 Sports Fan - come dressed up as your favorite sport, team or athlete! The tournament benefits the VRD's Tom Slaughter, Jr. Memorial Youth Recreation Grant, used to award funds to school-aged children who are in need of financial support to participate in VRD youth programs. 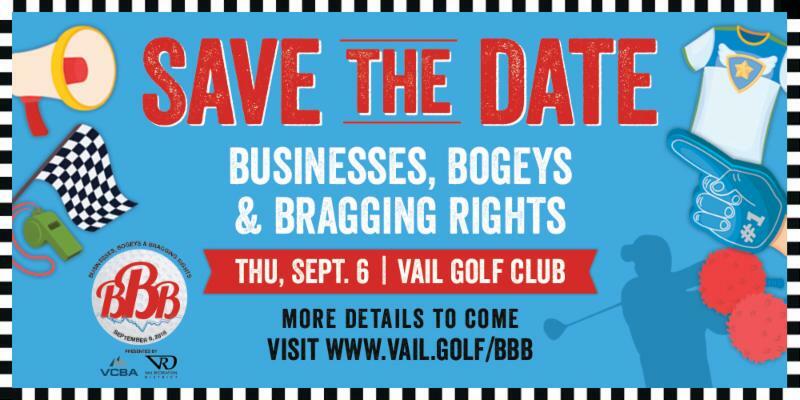 The VRD partners with the Vail Chamber & Business Association on this tournament, and teams, sponsors and silent auction donations are being sought. Check out theregistration and sponsorship form here, or the website here for more information. The Vail Recreation District's mission is to offer diverse and exceptional recreation opportunities that enhance the physical, social and emotional well-being of all its residents and guests. The VRD aims to help Vail Valley residents and visitors pursue their recreational passions by providing the following outlets for competition in summer and winter via a running and a mountain bike race series, numerous tournaments and/or leagues for hockey, volleyball, lacrosse, softball, golf, tennis, soccer, flag football, broomball, pickleball, figure skating and rugby; venues like Dobson Ice Arena, Vail Golf Club, Vail Nordic Center, Vail Gymnastics Center, Vail Nature Center, Vail Skatepark, Vail Tennis Center, Community Programming, Vail's Imagination Station, Golden Peak Pickleball Center and use of additional gyms, playing fields and the surrounding White River National Forest via collaboration with local entities; sports classes and camps for youth, adults and families; and opportunities to learn about and appreciate our Rocky Mountain environment through guided activities, classes and camps.